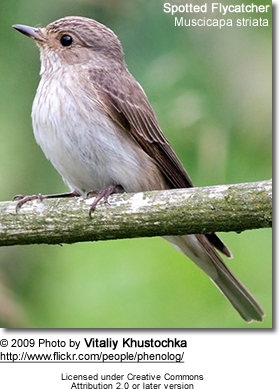 The Old World flycatcher family Muscicapidae is a large family of small passerine birds restricted to the Old World (Europa, Asia, and Africa). A group of flycatchers is often referred to as "outfield", "swatting", "zapper" or "zipper" of flycatchers. These are mainly small arboreal insectivores, many of which, as the name implies, take their prey on the wing. The appearance of these birds is very varied, but they mostly have weak songs and harsh calls. The nest of most is a well-constructed cup in a tree or hedge. Rusty-tailed Flycatcher, Muscicapa ruficauda : The Rusty-tailed Flycatcher is a small passerine bird in the flycatcher family Muscicapidae. Brown-breasted Flycatcher, Muscicapa muttui : The Brown-breasted Flycatcher is a small passerine bird in the flycatcher family Muscicapidae. It was named by Layard after Muttu, the cook in his collecting expedition. Atlas Flycatcher, Ficedula speculigera : Atlas Flycatcher is a bird in the an Old World Flycatcher family, one of the four species of Western Palearctic black-and-white flycatchers; it is endemic as a breeding species to North-west Africa. It was formerly regarded as a race of European Pied Flycatcher, but Sætre et al. (2001) recommended that it is regarded as a species in its own right. Identification is covered in Etherington and Small (2003) and van den Berg et al. (2006). 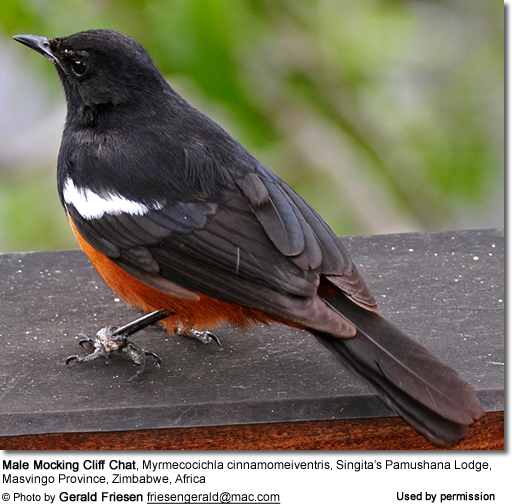 Blue-and-white Flycatcher, Cyanoptila cyanomelana : The Blue-and-white Flycatcher is a migratory songbird. It breeds in Japan, Korea, and in parts of China and Russia. It winters in South East Asia, especially in Vietnam, Cambodia, Thailand, Sumatra and Borneo. Verditer Flycatcher, Eumyias thalassina : The Verditer Flycatcher is an Old World flycatcher found in the Indian Subcontinent, especially in the Lower Himalaya. It is named after its distinctive shade of copper-sulphate blue and has a dark patch between the eyes and above the bill base. 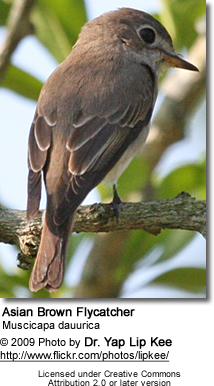 They are also interesting among the flycatchers in that they forage above the canopy level and perching on electric wires or exposed tree top branches. Nilgiri Flycatcher, Eumyias albicaudata : The Nilgiri Flycatcher is an Old World flycatcher with a very restricted range in the hills of southern India. Blue-throated Flycatcher, Cyornis rubeculoides : The Blue-throated Flycatcher is a small passerine bird in the flycatcher family Muscicapidae. It resembles Cyornis tickelliae but easily separated by the blue throat. The habitat of this species is in thicker forest than the other species.